An underground sprinkler system is a convenient way to keep your lawn properly watered regularly. You need to install it so the sprinklers cover every part of the lawn when activated. A sprinkler system with a timer and control box may best be left to professional installation, but you can install a system that connects directly to your water line at the outer spigot. This process can vary depending on the exact type of sprinkler system you buy. Draw a diagram of your entire lawn and property that is set to scale and has all objects like trees and shrubs set in their precise locations. Map out your system's path for your lawn, including the sprinkler locations. The system should start at your water faucet. Dig trenches to follow the path you mapped out. Dig the trenches about 3 inches deep and then push the sides of the trenches outward with the flat of your spade to widen them. Lay the kit's sprinklers near their planned locations. Connect one sprinkler -- preferably the one near the end of the sprinkler line -- to the water pipe from the kit, tightening the included pipe clamps around the sprinkler fitting with a screwdriver. The sprinkler fittings will point along the length of the trench. Assemble the rest of the sprinkler system by connecting the remaining sprinkler heads and pipes with their hose clamps. Use elbow pipe fittings in spots where the line turns corners. Make sure fittings match your pipe size if the system does not come with them. Place the sprinklers and pipes into the trench, starting at the end of the line and working your way to the starting spot at the spigot. Press down on the ground with your foot where the sprinklers are to hold them in place. 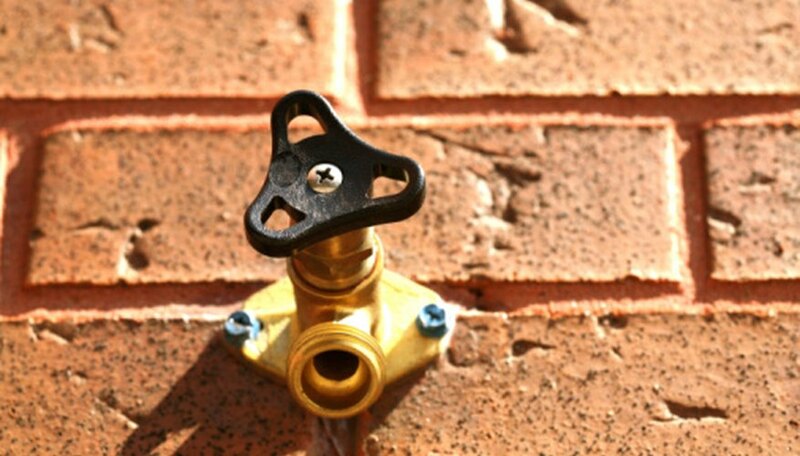 Connect the starting end of the sprinkler line to the spigot using either its own connector or a garden hose. This can vary depending on the type of system. Cover up and bury the pipes on the system, making sure the sprinkler heads are still free to pop up and spray. Always wear a breather mask when cutting plastic.